What, for example, constitutes a common? We have land, water, air commons, digital commons; our acquired entitlements, e.g., social security pensions, are often described as commons, and so are languages, libraries, and the collective products of past cultures. But are all these commons equivalent from the viewpoint of their political potential? Are they all compatible? And how can we ensure that they do not project a unity that remains to be constructed? Finally, should we speak of “commons” in the plural, or “the common,” as Autonomist Marxists propose we do, this concept designating in their view the social relations characteristic of the dominant form of production in the post-Fordist era? With these questions in mind, in this essay I look at the politics of the commons from a feminist perspective where “feminist” refers to a standpoint shaped by the struggle against sexual discrimination and over reproductive work, which, to paraphrase Linebaugh’s comment above, is the rock upon which society is built and by which every model of social organization must be tested. This intervention is necessary, in my view, to better define this politics and clarify the conditions under which the principle of the common/s can become the foundation of an anti-capitalist program. Two concerns make these tasks especially important. First, since at least the early 1990s, the language of the commons has been appropriated for instance by the World Bank and put at the service of privatization. Under the guise of protecting biodiversity and conserving the global commons, the Bank has turned rainforests into ecological reserves, has expelled the populations that for centuries had drawn their sustenance from them, while ensuring access to those who can pay, for instance, through eco-tourism.5 The World Bank is not alone in its adaptation of the idea of the commons to market interests. Responding to different motivations, a revalorization of the commons has become trendy among mainstream economists and capitalist planners; witness the growing academic literature on the subject and its cognates: social capital, gift economies, altruism. The extension of the commodity form to every corner of the social factory, which neo-liberalism has promoted, is an ideal limit for capitalist ideologues, but it is a project not only unrealizable but undesirable from the viewpoint of long-term reproduction of the capitalist system. Capitalist accumulation is structurally dependent on the free appropriation of immense quantities of labor and resources that must appear as externalities to the market, like the unpaid domestic work that women have provided, upon which employers have relied for the reproduction of the workforce. It is no accident, then, that long before the Wall Street meltdown, a variety of economists and social theorists warned that the marketization of all spheres of life is detrimental to the market’s well-functioning, for markets too, the argument goes, depend on the existence of non-monetary relations like confidence, trust, and gift giving.6 In brief, capital is learning about the virtues of the common good. 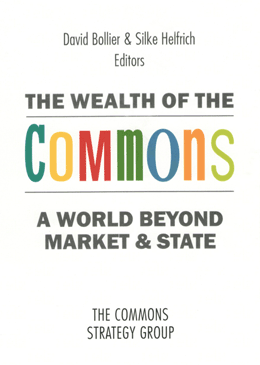 A second concern is the unanswered question of how commons can become the foundation of a non-capitalist economy. From Peter Linebaugh’s work, espe­cially The Magna Carta Manifesto (2008), we have learned that commons have been the thread that has connected the history of the class struggle into our time, and indeed the fight for the commons is all around us. Mainers are fighting to preserve access to their fisheries, under attack by corporate fleets; residents of Appalachia are organizing to save their mountains threatened by strip mining; open source and free software movements are opposing the commodification of knowledge and opening new spaces for communications and cooperation. We also have the many invisible, commoning activities and communities that people are creating in North America, which Chris Carlsson has described in his Nowtopia (2007). As Carlsson shows, much creativity is invested in the production of “virtual commons” and forms of sociality that thrive under the radar of the money/market economy. The most significant feature of urban gardens is that they produce for neighborhood consumption, rather than for commercial purposes. This distinguishes them from other reproductive commons that either produce for the market, like the fisheries of Maine’s “Lobster Coast,”8 or are bought on the market, like the land trusts that preserve open spaces. The problem, however, is that urban gardens have remained a spontaneous grassroots initiative and there have been few attempts by movements in the US to expand their presence and to make access to land a key terrain of struggle…. More generally, the left has not posed the question of how to bring together the many proliferating commons that are being defended, developed and fought for so that they can form a cohesive whole and provide a foundation for a new mode of production. It is in this context that a feminist perspective on the commons is important because it begins with the realization that, as the primary subjects of reproductive work, historically and in our time, women have depended on access to communal natural resources more than men and have been most penalized by their privatization and most committed to their defense. Women have also led the effort to collectivize reproductive labor both as a means to economize the cost of reproduction and to protect each other from poverty, state violence, and the violence of individual men. An outstanding example is that of the ollas communes (common cooking pots) that women in Chile and Peru set up in the 1980s when, due to stiff inflation, they could no longer afford to shop alone (Fisher 1993; Andreas 1985). Like land reclamations, or the formation of tontines, these practices are the expression of a world where communal bonds are still strong. But it would be a mistake to consider them something pre-political, “natural,” or simply a product of “tradition.” After repeated phases of colonization, nature and customs no longer exist in any part of the world, except where people have struggled to preserve them and reinvent them. As Leo Podlashuc has noted, grassroots women’s communalism today leads to the production of a new reality, it shapes a collective identity, it constitutes a counter-power in the home and the community, and opens a process of self-valorization and self-determination from which there is much that we can learn. The first lesson we can gain from these struggles is that the “commoning” of the material means of reproduction is the primary mechanism by which a collective interest and mutual bonds are created. It is also the first line of resistance to a life of enslavement and the condition for the construction of autonomous spaces undermining from within the hold that capitalism has on our lives. Undoubtedly the experiences I described are models that cannot be transplanted. For us, in North America, the reclamation and commoning of the means of reproduction must necessarily take different forms. But here too, by pooling our resources and re-appropriating the wealth that we have produced, we can begin to de-link our reproduction from the commodity flows that, through the world market, are responsible for the dispossession of millions across the world. We can begin to disentangle our livelihood not only from the world market but also from the war machine and prison system on which the US economy now depends. Not last we can move beyond the abstract solidarity that so often characterizes relations in the movement, which limits our commitment, our capacity to endure, and the risks we are willing to take. In a country where private property is defended by the largest arsenal of weaponry in the world, and where three centuries of slavery have produced profound divisions in the social body, the recreation of the common/s appears as a formidable task that could only be accomplished through a long-term process of experimentation, coalition building and reparations. But though this task may now seem more difficult than passing through the eye of a needle, it is also the only possibility we have for widening the space of our autonomy, and refusing to accept that our reproduction occurs at the expense of the world’s other commoners and commons. What this task entails is powerfully expressed by Maria Mies when she points out that the production of commons requires first a profound transformation in our everyday life, in order to recombine what the social division of labor in capitalism has separated. For the distancing of production from reproduction and consumption leads us to ignore the conditions under which what we eat, wear, or work with have been produced, their social and environmental cost, and the fate of the population on whom the waste we produce is unloaded (Mies 1999). In other words, we need to overcome the state of irresponsibility concerning the consequences of our actions that results from the destructive ways in which the social division of labor is organized in capitalism; short of that, the production of our life inevitably becomes a production of death for others. As Mies points out, globalization has worsened this crisis, widening the distances between what is produced and what is consumed, thereby intensifying, despite the appearance of an increased global interconnectedness, our blindness to the blood in the food we eat, the petroleum we use, the clothes we wear, and the computers we communicate with. Overcoming this state of oblivion is where a feminist perspective teaches us to start in our reconstruction of the commons. No common is possible unless we refuse to base our life and our reproduction on the suffering of others, unless we refuse to see ourselves as separate from them. Indeed, if commoning has any meaning, it must be the production of ourselves as a common subject. This is how we must understand the slogan “no commons without community.” But “community” has to be intended not as a gated reality, a grouping of people joined by exclusive interests separating them from others, as with communities formed on the basis of religion or ethnicity, but rather as a quality of relations, a principle of cooperation and of responsibility to each other and to the earth, the forests, the seas, the animals. Certainly, the achievement of such community, like the collectivization of our everyday work of reproduction, can only be a beginning. It is no substitute for broader antiprivatization campaigns and the reclamation of our common wealth. But it is an essential part of our education to collective government and our recognition of history as a collective project, which is perhaps the main casualty of the neoliberal era of capitalism. On this account, we too must include in our political agenda the commu­nalization of housework, reviving that rich feminist tradition that in the US stretches from the utopian socialist experiments of the mid-nineteenth century to the attempts that “materialist feminists” made from the late nineteenth century to the early twentieth century to reorganize and socialize domestic work and thereby the home and the neighborhood, through collective housekeeping – attempts that continued until the 1920s when the Red Scare put an end to them (Hayden 1981 and 1986). These practices and, most importantly, the ability of past feminists to look at reproductive labor as an important sphere of human activity not to be negated but to be revolutionized, must be revisited and revalorized. As the capitalist crisis destroys the basic elements of reproduction for millions of people across the world, including in the United States, the reconstruction of our everyday life is a possibility and a necessity. Like strikes, social/economic crises break the discipline of wage work, forcing new forms of sociality upon us. This is what occurred during the Great Depression, which produced a movement of hobos who turned the freight trains into their commons, seeking freedom in mobility and nomadism (Caffentzis 2006). At the intersections of railroad lines, they organized hobo jungles, pre-figurations, with their self-governance rules and solidarity, of the communist world in which many of the hobos believed (Anderson 1998, Depastino 2003 and Caffentzis 2006). However, but for a few Boxcar Berthas,12 this was predominantly a masculine world, a fraternity of men, and in the long term it could not be sustained. Once the economic crisis and the war came to an end, the hobos were domesticated by the two great engines of labor power fixation: the family and the house. Mindful of the threat of working class recomposition during the Depression, American capital excelled in its application of the principle that has characterized the organization of economic life: cooperation at the point of production, separation and atomization at the point of reproduction. The atomized, serialized family house that Levittown provided, compounded by its umbilical appendix, the car, not only sedentarized the worker but put an end to the type of autonomous workers’ commons that hobo jungles had represented (Hayden 1986). Today, as millions of Americans’ houses and cars are being repossessed, as foreclosures, evictions, and massive loss of employment are again breaking down the pillars of the capitalist discipline of work, new common grounds are again taking shape, like the tent cities that are sprawling from coast to coast. This time, however, it is women who must build the new commons so that they do not remain transient spaces, temporary autonomous zones, but become the foundation of new forms of social reproduction. If the house is the oikos on which the economy is built, then it is women, historically the house workers and house prisoners, who must take the initiative to reclaim the house as a center of collective life, one traversed by multiple people and forms of cooperation, providing safety without isolation and fixation, allowing for the sharing and circulation of community possessions, and, above all, providing the foundation for collective forms of reproduction. As has already been suggested, we can draw inspiration for this project from the programs of the nineteenth century materialist feminists who, convinced that the home was an important “spatial component of the oppression of women,” organized communal kitchens, cooperative households calling for workers’ control of reproduction (Hayden 1981). These objectives are crucial at present. Breaking down the isolation of life in the home is not only a precondition for meeting our most basic needs and increasing our power with regard to employers and the state. As Massimo De Angelis has reminded us, it is also a protection from ecological disaster. For there can be no doubt about the destructive consequences of the “un-economic” multiplication of reproductive assets and self-enclosed dwellings that we now call our homes, dissipating warmth into the atmosphere during the winter, exposing us to unmitigated heat in the summer (De Angelis 2007). Most importantly, we cannot build an alternative society and a strong self-reproducing movement unless we redefine our reproduction in a more cooperative way and put an end to the separation between the personal and the political, and between political activism and the reproduction of everyday life. It remains to be clarified that assigning women this task of commoning/collectivizing reproduction is not to concede to a naturalistic conception of femininity. Understandably, many feminists view this possibility as a fate worse than death. It is deeply sculpted in our collective consciousness that women have been designated as men’s common, a natural source of wealth and services to be as freely appropriated by them as the capitalists have appropriated the wealth of nature. But to paraphrase Dolores Hayden, the reorganization of reproductive work, and therefore the reorganization of housing and public space, is not a question of identity; it is a question of labor and, we can add, a question of power and safety (Hayden 1986). I am reminded here of the experience of the women members of the Landless People’s Movement of Brazil [the MST] who, after their communities won the right to maintain the land that they had occupied, insisted that the new houses be built to form one compound so that they could continue to communalize their housework, wash together, cook together, as they had done in the course of the struggle, and be ready to run to give each other support when abused by men. Arguing that women should take the lead in the collectivization of reproductive work and housing is not to naturalize housework as a female vocation. It is refusing to obliterate the collective experiences, the knowledge and the struggles that women have accumulated concerning reproductive work, whose history has been an essential part of our resistance to capitalism. Reconnecting with this history is a crucial step for women and men today both to undo the gendered architecture of our lives and to reconstruct our homes and lives as commons. Andreas, Carol. 1985. When Women Rebel: The Rise of Popular Feminism in Peru. Westport, CT. Lawrence Hill & Company. Anderson, Nels. 1998. On Hobos and Homelessness. Chicago, IL. University of Chicago Press. Carlsson, Chris. 2008. Nowtopia. Oakland, CA. AK Press. Caffentzis, George. 2004. “Globalization, The Crisis of Neoliberalism and the Question of the Commons.” Paper presented to the First Conference of the Global Justice Center. San Migel d’Allende, Mexico, July 2004. —————. “Three Temporal Dimensions of Class Struggle.” Paper presented at ISA Annual meeting held in San Diego, CA (March 2006). De Angelis, Massimo. 2007. The Beginning of History: Value Struggles and Global Capital. London, UK. Pluto Press. —————. “The Commons and Social Justice.” Unpublished manuscript, 2009. DePastino, Todd. 2003. Citizen Hobo. Chicago, IL. University of Chicago Press. The Ecologist. 1993. Whose Commons, Whose Future: Reclaiming the Commons. Philadelphia, PA. New Society Publishers with Earthscan. Federici, Silvia. 2011, “Women, Land Struggles, and the Reconstruction of the Commons.” WorkingUSA. The Journal of Labor and Society (WUSA), 14(61) (March 2011), Wiley/Blackwell Publications. Published in Spanish as “Mujeres, luchas por la tierra, y la reconstrucción de los bienes comunales,” In Veredas, No. 21, 2010. Issue dedicated to Social Movements in the 21st century. Veredas is the Journal of the Department of Social Relations of the Universidad Autonoma Metropolitana of Mexico City in Xochimilco. —————. 2008. “Witch-Hunting, Globalization and Feminist Solidarity in Africa Today.” Journal of International Women’s Studies, Special Issue: Women’s Gender Activism in Africa. Joint Special Issue with WAGADU. 10(1) (October 2008): 29-35. —————. 2004. Caliban and the Witch: Women, The Body, and Primitive Accumulation. Brooklyn, NY. Autonomedia. —————. 2004. “Women, Land Struggles and Globalization: An International Perspective.” Journal of Asian and African Studies. 39(1/2) (January-March 2004). —————. 2001. “Women, Globalization, and the International Women’s Movement.” Canadian Journal of Development Studies. 22:1025-1036. Fisher, Jo. 1993. Out of the Shadows: Women, Resistance and Politics in South America. London, UK. Latin American Bureau. Hayden, Dolores. 1981. The Grand Domestic Revolution. Cambridge, MA. MIT Press. —————. 1986. Redesigning the American Dream: The Future of Housing, Work and Family Life. New York, NY. Norton. Isla, Ana. “Enclosure and Microenterprise as Sustainable Development: The Case of the Canada-Costa Rico Debt-for-Nature Investment.” Canadian Journal of Development Studies. 22 (2001): 935-943. —————. 2006. “Conservation as Enclosure: Sustainable Development and Biopiracy in Costa Rica: An Ecofeminist Perspective.” Unpublished manuscript. —————. 2009. “Who pays for the Kyoto Protocol?” in Eco-Sufficiency and Global Justice, Ariel Salleh, ed. New York, London. Macmillan Palgrave. Mies, Maria and Bennholdt-Thomsen, Veronika. 1999. “Defending, Reclaiming, and Reinventing the Commons,” In The Subsistence Perspective: Beyond the Globalized Economy. London: Zed Books, Reprinted in Canadian Journal of Development Studies, 22 (2001): 997-1024. Podlashuc, Leo. 2009. “Saving Women: Saving the Commons.” In Eco-Sufficiency and Global Justice, ed. Ariel Salleh. New York, London: Macmillan Palgrave. Shiva, Vandana. 1989. Staying Alive: Women, Ecology and Development. London. Zed Books. —————. 1991. Ecology and The Politics of Survival: Conflicts Over Natural Resources in India. New Delhi/London. Sage Publications. —————. 2005. Earth Democracy: Justice, Sustainability, and Peace. Cambridge, MA. South End Press. This chapter is adapted from an essay originally published in The Commoner, January 4, 2011, available at http://www.commoner.org.uk/?p=113. It has also been published in Uses of a Worldwind: Movement, Movements, and Contemporary Radical Currents in the United States, edited by Craig Hughes, Stevie Peace and Kevin Van Meter for the Team Colors Collective (Oakland: AK Press, 2010). 1. Linebaugh, Peter. 2008. The Magna Carta Manifesto: Liberty and Commons for All. Berkeley, CA. University of California Press. 2. A key source on the politics of the commons and its theoretical foundations is the UK-based electronic journal The Commoner, now entering its fourteenth year of publication (www. commoner. org.uk). See also the essay by Gustavo Esteva in this book. 5. For more on this subject, see the important article, “Who Pays for the Kyoto Protocol?” by Ana Isla, in which the author describes how the conservation of biodiversity has provided the World Bank and other international agencies with the pretext to enclose rainforests on the ground that they represent “carbon sinks” and “oxygen generators.” In Salleh. 2009. 6. Bollier, David. 2002. Silent Theft: The Private Plunder of Our Common Wealth. New York and London: Routledge. 36–39. 7. An early, important work on urban gardens is Bill Weinberg and Peter Lamborn Wilson, eds. 1999. Avant Gardening: Ecological Struggle in the City & the World. Brooklyn, NY: Autonomedia. See also the essay by Christa Müller in this book. 8. The fishing commons of Maine are presently threatened with a new privatization policy justified in the name of preservation and ironically labeled “catch shares.” This is a system, already applied in Canada and Alaska, whereby local governments set limits on the amount of fish that can be caught by allocating individual shares on the basis of the amount of fishing that boats have done in the past. This system has proven to be disastrous for small, independent fishermen who are soon forced to sell their share to the highest bidders. Protest against its implementation is now mounting in the fishing communities of Maine. See “Cash Shares or Share-Croppers?” Fishermen’s Voice, Vol. 14, No.12, December 2009. 9. Donald B. Freeman, “Survival Strategy or Business Training Ground? The Significance of Urban Agriculture For the Advancement of Women in African Cities.” African Studies Review, 36(3) (December 1993): 1-22. Also, Federici 2008. 10. Shiva 1989, 1991:102–117, 274. 11. I owe this information to Ousseina Alidou, Director of the Center for African Studies at Rutgers University (NJ). 12. Boxcar Bertha (1972) is Martin Scorsese’s adaptation of Ben Reitman’s Sister of the Road, “the fictionalized autobiography of radical and transient Bertha Thompson.” (Wikipedia) See Reitman, Ben. 2002. Dr. Sister of the Road: The Autobiography of Boxcar Bertha. Oakland, CA. AK Press. Silvia Federici is a long time activist, teacher and writer. She is the author of many essays on political philosophy, feminist theory, cultural studies, and education.